Today in Masonic History we present A Life in a Day. The Riddle of the Sphinx: "What walks on four legs in the morning, two legs at noon, and three legs in the evening?" For most Mason's who attend lodge regularly the stations of the Worshipful Master and two Wardens are well known, sitting in the east, west and south. The Worshipful Master sitting in the east the source of light, a metaphor for knowledge, the Senior Warden sitting in the west ready to receive the weary brothers home from their hard days in the quarries and the Junior Warden in the south, ready to feed the hungry brothers. There is a deeper meaning, as with many symbols in the fraternity, than just what we normally talk about in our ritual. 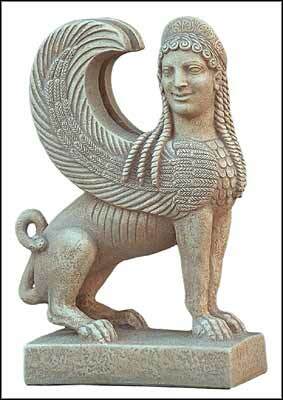 It goes back to the Riddle of the Sphinx, as we stated in the beginning of this piece. The above is actually a more common watered down version of the riddle. The riddle as it appears in Oedipus is "Which creature has one voice and yet becomes four-footed and two-footed and three-footed?" The riddle was answered by the hero avoiding the death that befell others who came before him. There is also evidence that the story of the Riddle pre-dated Oedipus and has been found in other ancient cultures. Regardless of the version of the riddle, the answer is always the same - man. A person crawls as an infant, walks on two legs in the prime of their life and walks with a cane toward the end of their life. Taking this and applying it to the east, west and south of a masonic lodge a mason first receives light in the east from the Worshipful Master, or the birth of his journey. Moving clockwise around the lodge, the brother approaches the south in the middle of his journey or as DeMolay puts it the "noontime of life where half our years lie before us and half behind us." Finally he arrives in the west the end of the metaphorical day to his resting place. There is an additional riddle sometimes attributed to the Sphinx it is "There are two sisters: one gives birth to the other and she, in turn, gives birth to the first. Who are the two sisters?" The answer can also be applied to Freemasonry. It is day and night or, put another way, the Sun and the Moon. The Sun and Moon is used as imagery to describe a guiding rule of the Worshipful Master in the lodge as the burning tapers are explained, to govern his lodge with equal regularity. The Sun and Moon are also used as symbols for the Senior Deacon and Junior Deacon respectively. Finally it is a reminder of the most precious of resources to all men and masons, time. The metaphor of a life in a day reminds us of how fleeting life can be. The lesson of time is so important that in all three degrees specific items are referenced to remind us of how to use our time more efficiently and how time levels us all. Although the Riddle of the Sphinx is not specifically masonic, it should be noted that two sphinx guard the entrance to the House of the Temple, the headquarters of the Southern Masonic Jurisdiction of the Ancient Accepted Scottish Rite.